UniTel Voice is a small office phone system priced and designed for everyday entrepreneurs — regular people who have said “the heck with corporate life” and decided to start, run, and grow their own business. Below we’ll answer the question, “What is a small business phone system?”, and explain why UniTel Voice is the right choice for small companies like self-funded start-ups, home businesses, and small business owners working in either a small office or virtual office environment. 1. 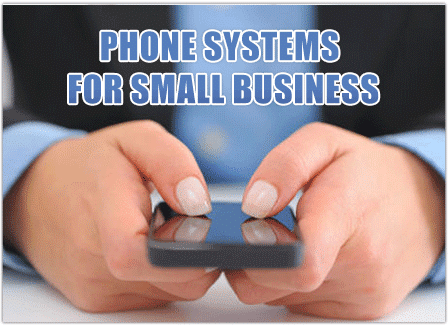 What is a small business phone system? In a nutshell, a small business phone system is a telephone solution designed to manage the inbound and outbound call traffic of an organization or group of people. Today, most business phones systems are VoIP (Voice over Internet Protocols) with a built-in virtual PBX and auto attendant. However, there are many different kinds of cloud-based business phone systems offering different pricing structures, equipment, features, and software integrations to consider. But first, for purposes of this discussion, we should define the term “small business”. A small business is sometimes defined as a company with 1000 employees and tens of millions of dollars in revenue. However in this product category, really any company over 100 employees is way too big. Most small business phone system products are usually designed for one of three markets: companies with 20-100 employees, companies with 5-20 employees, and companies with 1-5 employees. So what’s the difference between them? Phone systems for companies with 20-100 employees are usually business VoIP phone systems that charge per user and require the setup of physical phone system equipment, such as IP-phones and special VoIP routers to ensure call quality. Phone systems for companies with 1-5 employees are typically virtual phone systems like UniTel Voice. These are business phone systems with a virtual auto attendant that works with your existing phones (i.e., cell, home, office, or mobile app). And don’t worry, you can still keep your business calls, texts, faxes and voicemail separate from your personal calls, texts, faxes, and voicemail. You manage everything online. There’s no equipment to maintain or software to update. Also, you don’t have to pay per user so it’s typically much more affordable. Companies with 5-20 employees fall somewhere in-between and it depends on your situation. If you have an office or a store where it makes sense to just forward business calls to your existing landlines, VoIP lines, or cell phones than a virtual phone system is the right choice. If you want physical desktop phones at each person’s workstation than you might look into getting a business VoIP quote. 2. What is the difference between a virtual PBX and an auto attendant? For practical purposes, there’s really no difference. Technically a virtual PBX refers to the business phone system as a whole and the auto attendant refers to the ability to set up a greeting that presents a menu of employee and department extension options for the caller to choose (an example script might be: “Thank you for calling ABC Company, for Sales Press 1, for Support Press 2. If you know your party’s extension you may dial it at any time”). 3. What is the difference between an auto attendant and an IVR? An auto attendant (automated attendant) presents a simple greeting and the routes you to the proper person or phone by asking you to press the number for your party’s extension. An IVR (interactive virtual receptionist) is sophisticated telecommunication software that allows the caller to use voice commands to answer questions and get information. An IVR can integrate into your payment processing or CRM system to allow callers to place orders or make changes to their accounts. 4. What is the difference between a business VoIP phone system and a virtual phone system? The major difference is a business VoIP phone system requires the setup of physical equipment (special routers and IP-phones that run off your local Internet service provider) and are more expensive because they charge per user. Whereas, a virtual phone system require not equipment and are much cheaper offering a simple app that turns your personal cell phone into your office desk phone whenever needed. That’s why they are often referred to as virtual office phone system. 5. What is the difference between a virtual phone system and virtual number? In some cases they can be one in the same, however, the big difference is a standalone virtual phone number (be it local or toll free) does not necessarily have all the features of an auto-receptionist. It could just simply forward a number to your phone like Google Voice. 6. Why do I need a business phone system? If you’re a large company this answer to this question is obvious – you need a business phone system to meet your customer’s needs. However, if you’re a startup or a one-person business, you might wonder if you really need a “business phone system”. Sounds like a hassle. Why couldn’t you just run your business using your cell phone? The answer is professionalism. You need a phone system that will help you sound professional and keep you connected. The good news is you can have your cake and eat it too. With a virtual phone system, you can run your business from your cell phone without having to deal with the cost or setup hassle of traditional business telephone systems. 7. Is UniTel Voice the best choice for your business? If you’re a solo entrepreneur, a bootstrapped startup, remote team, home-based business owner, or any kind of on-the-go entrepreneur, UniTel Voice is the best small business phone system for you. It’s priced and designed for business owners just like you (read reviews from real business owners) and it allows you to run your business using cell phones, yet look, sound, and operate like a Fortune 500 company. All the power of an expensive enterprise business phone solution from one affordable easy-to-use smartphone app.